Three solo singer/songwriters joined forces for what they thought would be a one-time performance at a tiny Canadian guitar shop. The three had such onstage chemistry the guitar shop owner asked them back for a repeat performance and was soon convincing them to tour. The Wailing Jennys was born and in 2004, they released 40 Days. The album won them a Juno Award (Canadian Grammy) and, buoyed by their appearances on A Prairie Home Companion, they began selling out venues across the US and Canada. Their 2007 follow-up Firecracker, which delved into alt-country, pop and rock, was awarded a Juno and charted on Billboard for 56 weeks. Their thrilling live shows are captured on 2009s Live at Mauch Chunk Opera House, which has won critical acclaim. 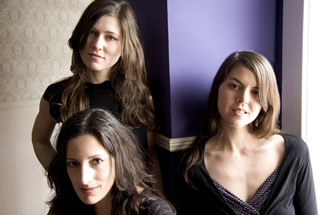 The Jennys have a wide range of musical backgrounds  from classically trained pianists to harmonica and ukulele virtuosos, they continue to pursue successful solo careers while presenting a united folk front.